How Can We Know God’s Heart? If you’ve been around this blog for awhile, you know how much I love sharing books and other resources to help us grow closer to Christ. This month features a series of powerful little books by Ty Saltzgiver, and we’ll be giving away a different one every week. Today’s post is from My First Thirty Quiet Times, a day-by-day devotional that has sold more than 600,000 copies. In this excerpt from Day 5, Ty asks some really good questions: How can we know the Father’s heart? How can we be sure that God really is GOOD, and that He truly CARES for us? And how can we be sure we can trust Him? So often, Christianity is presented to us as a set of beliefs to adhere to and a set of rules (or commands) to obey. In other words, we must believe what is true and do what is right. If we do, then we are a Christian, or to the degree that we do these well, then we are good Christians. Certainly, there are things to believe and a way God wants us to live, but they are not “in order to be” a Christian. Rather, they are “because of” the reality that we have a relationship with Jesus, where we’ve received His love and invited Him to live in our hearts and trusted Him with our lives. It is a huge thing to entrust our very lives to God, to give Him the thing most precious to us–our hearts. Therefore, to trust God, we must be convinced His heart is GOOD and that He truly CARES for us. How can we know the Father’s heart? Jesus says essentially, “Let me tell you a story to try and describe for you my Father’s heart.” And then he tells the Prodigal Son parable. He says His Father is always standing on the porch waiting and looking for us who are lost or hurting. Then, when He sees us, He rushes to meet us and showers us with kisses, healing and restoring us. Jesus represents (and therefore reveals) His Father as the One who pursues and accepts us. Even when there is infidelity or inattention on our part, God’s acceptance is always absolute, no retribution or payback is required. 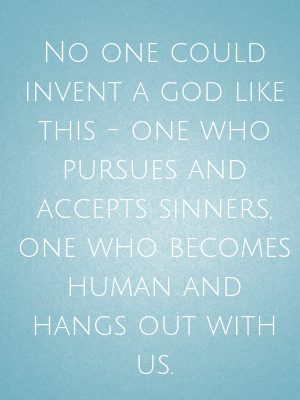 No one could invent a god like this–one who pursues and accepts sinners, one who becomes human and hangs out with us. All other gods despise sinners, condemn them, and withhold blessings from them. Not Jesus’ Father. Not our Heavenly Father. Of course, Jesus’ death on the cross tells us more about the Father’s heart than anything else. Can you imagine the Father’s agony over His Son’s suffering and death, all so we could be in a relationship with Him? When someone dies for you, you no longer question if that person cares for you, or if you matter to them. You can trust their heart with yours. Thank you for sending Jesus to not only be the way to You but also to show us who You are. Help me to know You more and trust You more. Ty Saltzgiver (above) spent over 40 years with Young Life, and he’s particularly gifted at making complex spiritual issues easy to grasp. 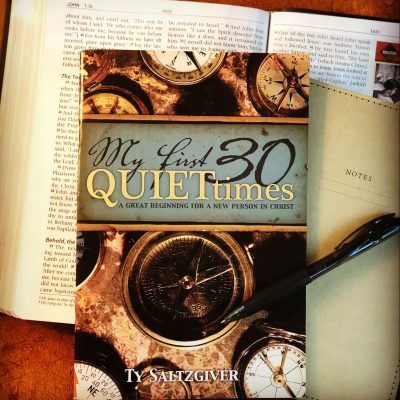 My First Thirty Quiet Times comes with short scripture readings, thoughtful application steps, and a prayer every day. The book is designed for a new Christian, but I’ve picked up it up countless times over the years when I want straightforward answers on topics ranging from sin and forgiveness, to what to do when doubt comes, to knowing God’s will for my life. If you’d like a free copy, post a comment here or on Instagram (@Jodie_Berndt) or Facebook (@JodieBerndtWrites) for your chance to win. Or, since the books cost just $1.99, go ahead and order one–or ten!–and share this great resource with someone you love!